I was looking over some of the stuff i have finished and noticed that i haven't really done very many pieces where the subject is a female. 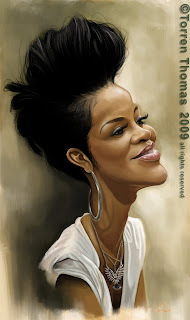 since i don't want this to turn into the "sausagefest" blog, i decided to do a quick painting of R&B songstress Rihanna. She has some great features for caricature and let's face it, that flock of seagulls doo she sports is screaming to be painted. anyway sorry again for neglecting you ladies. will post more soon. Hi Torren, you have some really excellent caricatures and awesome gallery at your website. Have you sold any print of your works yet? I saw from your profile that you are working in the cable industry... when are you going into caricaturing full-time? Homie, I don't see any bruises on this one. Your work is inpirational! Thanks for the large pics, they really show off your talents.